Egg n' biscuitt w/ housemade sausage! My favorite part of the Weekend New York Times is the Metropolitan Section’s, “Sunday Routine.” I love reading how interesting New Yorkers go about their weekends, and I like that much of it highlights the importance of breakfast. Let’s say my sister Carol is in next week’s “Sunday Routine.” She’d say her weekend routine always includes a comforting, eggy breakfast in her Carroll Gardens neighborhood. One of the places she frequents and has long told me about is Cantine. A small nondescript restaurant/catering company* with the name almost invisible outside, Cantine has become known for its excellent, if limited menu, which changes daily. You get the feeling that absolutely no thought has gone into the restaurant décor so that every iota of care and effort goes into the food. One bite into the thick layers of buttery, flaky biscuit, soft squishy eggs and homemade sausage, and I was in heaven. The Cantine sausage has the kind of savory flavor you want in a breakfast sausage, but without the grease. The Chef’s sandwich was not so ladylike after all, a decent sized open-faced sandwich on good bread, and I have to say that the pretentious sounding “chili threads” made all the difference. They sewed a whiff of chipotle through the thick slabs of avocado and sliced egg that kept popping off the bread with each bite. And I could tell Cantine did what the Chef does to lesson the bitterness of red onions: soaking them in water. 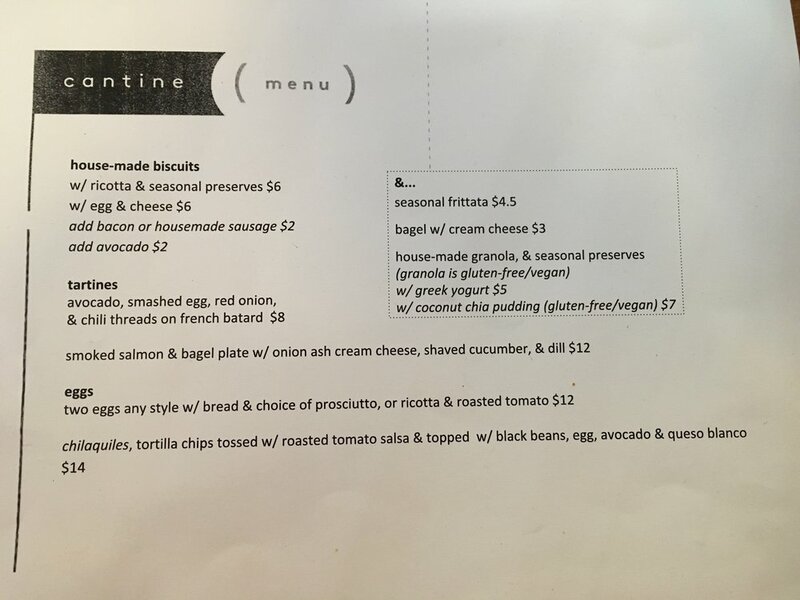 While each of our items was good and priced well, we were still a bit peckish and the biscuit was sooo excellent, we decided to split Cantine’s signature item: the same biscuit with ricotta and house made preserves. *Cantine closes at 2:00 PM each day now. When I asked a woman who seemed to be running the place why, she said that the restaurant and its catering business had been operating out of the same kitchen, something that just was not sustainable. They are working on some kind of “surprise” solution, and I’m just glad to know that Cantine, the restaurant, will remain open when normal hours resume. Who knows. Maybe they’ll add a table or two or more offerings to the spartan menu!